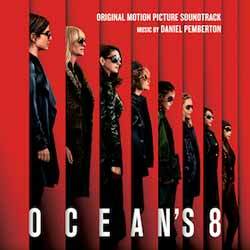 If you're a fan of jazz and swinging '60s scores then Daniel Pemberton's soundtrack for Ocean's 8 has a lot for you to get your ears around. Even though I'm not a huge fan of this genre of music, I did find it engaging. There were a lot of tracks that sounded familiar - mainly because Pemberton uses instruments and styles that are only really used in that genre. For example the flute and organ on 'In Vogue' only ever sound like that in '60s tracks. 'Brooklyn Necklace' reminded me of a cinema advert (from the '80s) but while I can vividly remember the tune I couldn't for the life of me place what the ad was (despite it driving me to distraction to the point where I spent several hours on YouTube looking at '80s cinema ads). Overall this is a funky little score. It won't be everyone's cup of tea, but if you've seen the movie you'll know exactly what to expect.